A new boat designed especially for disabled sailors has just been completed at the Spaulding Marine Center in Sausalito. Known as the SV14, the boat was dry launched at Spaulding’s annual party on Saturday. Built entirely with volunteer labor over the last year and a half, the boat is one of just seven being built around the world, and the only one in the Americas. The idea for the SV-14 started with Peter Jacobs, a yacht certification officer from the Netherlands who felt strongly that there needed to be an affordable way to provide disabled sailors with boats. Para Sailing had been dropped for the Tokyo 2020 games, as it didn’t meet the minimum criteria for worldwide reach as stated in the International Paralympic Committee’s Handbook. The IPC handbook states only team sports widely an! d regularly practiced in a minimum of 24 countries and three IPC regions and a minimum of 32 countries in three regions for individual sports are considered for inclusion. 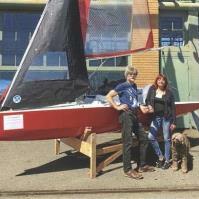 Jacobs launched an international plea in the fall of 2015 for volunteer help to design an affordable disabled sailing boat. South African-based multi hull designer Alex Simon's took the challenge and designed a boat with a do-it-yourself twist to address cost issues — the boat would be made entirely from plywood, could be constructed in less than 200-man hours, and would cost $3000. Simon' s based the concept on the Mirror Dinghy which was first designed in the United Kingdom in 1962 — a boat kit that cost under $100 at the time. 56 years later, over 70,000 Mirror dinghies are in circulation. Jacobs and Simon's needed a few boat builders to see how the construction method would work. Spaulding Marine Center decided it was a project worth pursuing, especially given the active Bay Area ! disabled sailing scene, largely organized by BAADS (Bay Area Association of Disabled Sailors). Peter Saggers, a New Zealander who sailed into San Francisco with his wife for family business a few years ago, was volunteering at Spaulding Boat Center and agreed to build an SV-14. "Boat costs for disabled sailors were upwards of $50,000 due to low volumes and no real production expediencies...beyond the means of most people in wheelchairs," Saggers said. "The construction generally worked well, and I came up with some new construction methods." Since this first fleet of plywood SV-14s have been built, a significantly serendipitous development has occurred, with a Chinese boat manufacturing company agreeing to tool up and produce fiberglass versions of the boats for the same price — $3000 — as well as the plywood kit set. "There’s an ! enormous future for the boat, not only for disabled sailors but for older people who don’t have the strength to climb in and out of dinghies — this is a ballasted dinghy and it can only heel to about 70 degrees, so it will not tip over in any sort of moderate conditions." Kathi Pugh, vice commodore of BAADS has been quadriplegic since a skiing accident in 1979. She sailed prior to her accident and joined BAADS in 1991. She cited the lack of suitable boats as the reason she’s experienced long lapses without sailing and is very excited about getting in the SV-14. "I’ve been to see the boat under construction several times as Spaulding thought I may be able to offer feedback," Pugh said. "There’s never been a boat my husband and I could sail together where I could contribute; Usually I sit there and tell him what to do. The SV-14 will be different." Adaptive features on the SV-14 include canting bucket seats and twin rudders which are controlled by two electrical switches to manage seating and rudder angles, easily manipulated by someone with a high-level injury like Pugh. The boat features a tall square-top main sail and carries an asymmetrical spinnaker on a protractible prod. It also has a shorter rig and it can be sailed with or without a jib. "There are few boats around the world which someone like myself can sail in a regatta," she said. "It’s really special that the SV-14 is built with a high level quad in mind and yet it’s still high performance." Betsy Alison, former US Paralympic Sailing Team head coach, agrees ! that the SV-14 can provide an affordable platform for developing programs. "The layout of the boat looks very promising, and the videos of sailors sailing the boat are exciting to see. Any type of boat including the SV-14, or class association that supports athlete engagement, athlete development, and competition at local, regional, national and international levels is welcomed by the Para Sailing community. Alison reminded that the application to IPC for re-inclusion for the 2024 Paralympic Games will be submitted in July with a decision expected by IPC in January of 2019.